Other Cables: Plastic housing and simple assembling → Easy to fall apart under light use. iVanky DP to DP Cable: Aluminum alloy shell and molding in one technolog → Effectively prevents cracking and is hard to fail. ·Supports 3D, 8-bit and 10-bit deep color and sharp images. ·Up to 4Kx2K, including 3840x2160, 2560x1600, 2560x1440, 1920x1200, 1080P, etc. ·HBR2 rated; Compliant to version 1.4 specs and backwards compatible to Version 1.1a; Works with DP, DP++ and DisplayPort++. 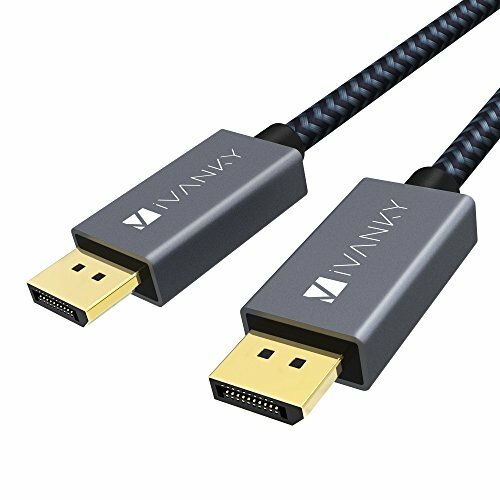 iVanky DisplayPort to DisplayPort Cable is good for video streaming or gaming. Compliant to version 1.4 specifications; Supports DP, DP++, and DisplayPort++. If you have any questions about this product by ivanky, contact us by completing and submitting the form below. If you are looking for a specif part number, please include it with your message.